NEW YORK (CNNfn) - They called him "The Flying Dutchman" and if you want a piece of him, you'd better fasten your seat belt. 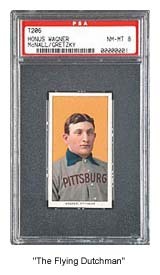 To the baseball card aficionado, the T206 Honus Wagner is on equal footing with the Holy Grail and the Mona Lisa. Experts say the item, previously owned by hockey great Wayne Gretzky, is recognized as the most valuable and desirable card in the world. Tagged as one of the greatest shortstops in history, John Peter "Honus" Wagner was one of the five initial inductees to baseball's Hall of Fame. The T206 card, issued in 1909 by the American Tobacco Co., is now a part of cyberspace history -- Robert Edward Auctions of Watchung, N.J. put the celebrated card up for sale through online auction house eBay Inc. (EBAY: Research, Estimates). "It's a big deal wherever this card is sold," said Robert Lifson, director of Robert Edward Auctions. "I was thinking how could I leverage the publicity value of this card. I thought it would be really something if I approached eBay with this idea." Bidding on the 10-day auction, which began Wednesday, starts at $500,000 and experts are looking for records to be broken. The current record is $641,500 for the same card, paid by sports collector Michael Gidwitz in 1996. The sellers are hoping to see bidding go out of the ballpark and exceed the $1 million mark. For those willing to step up to the plate, the sports memorabilia auction company has set up special rules for this particular auction. Bidders are required to wire a $100,000 deposit to iEscrow.com and bids will be taken in $50,000 increments. Bidding is set to end on July 15 -- if there has been no new bid for about 15 minutes after 4:15 p.m. Pacific time on that day. Lifson said the 15-minute rule is an effort to halt "sniping" -- the practice of slipping in a cyber-bid just as the clock is running out, thus cutting other potential bidders out of the game. "It only has to happen to you once before you sort of know how it works," Lifson said. What makes the Wagner card so special? Rich Klein, price guide analyst for Beckett Publications, said the triple play of a great player, a good-looking card and a limited quantity all make the Wagner a winner. "It's the Holy Grail," he said. "The collectors for it outnumber the number available on the market." Lifson said the card has been heralded as the most valuable, most desired card in the world ever since there's been organized collecting. The story behind the card is also intriguing. Wagner, who batted .329 and stolen 720 bases in his career with the Pittsburgh Pirates, reportedly objected to having his name associated with smoking and demanded the tobacco company stop producing and distributing his likeness. �Others dismiss this theory, saying Wagner just wanted more money -- some things never change, do they? However, Lifson said there is evidence to support the anti-tobacco theory. Type in the name "Honus Wagner" on the eBay search engine and a list of 140 items come up, including an auction for another Wagner card scheduled to end at 8:35 p.m. Pacific time on Saturday. The opening bid on this card is $300,000 and as of Thursday afternoon there were no others. The high bid for the Robert Edward Auctions' card was $600,000 late Thursday afternoon. Consumers may be wary about bidding for items over the Internet. Last month eBay confirmed the FBI was investigating a case involving the practice of shilling, where a seller bids on his or her own item. "We have a great number of people who play by the rules and demonstrate a high level of respect for their fellow eBay users," said eBay spokesman Kevin Pursglove. "But you will find from time to time, people who step outside of the rules." � Identify the seller and check the seller's feedback rating. � Some sellers may use a forged e-mail header, making follow-up contact impossible. Get a telephone number for seller and use it to confirm that you have some way other than e-mail to contact the seller. � Do your homework -- know what you're bidding on, its relative value and all terms and conditions of the sale, including return policies and who pays for shipping. � Establish your top price and stick to it. � Use a credit card whenever possible as it offers the most protection if there's a problem. Consider using an escrow service if the seller doesn't accept credit cards. "If you're going to spend all that money, make sure you do all your due diligence," Klein said. "And if something is too good to be true, it probably is."